Hi there! Today I’m sharing a review for a new M/M paranormal mystery/romance from Santino Hassell. 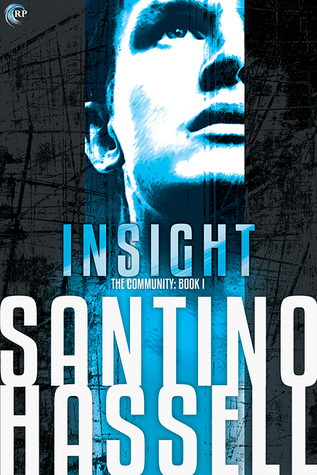 INSIGHT is the first book in his The Community series and features an empathy on the hunt for clues to his estranged twin’s death. Was it murder, or a tragic accident? I’ve loved Hassell’s contemporary romances, SUNSET PARK, FIRST AND FIRST, and INTERBOROUGH, so I couldn’t wait to jump into this new series. Nate Black is a 22 y/o empath trying to make it on his own in a Houston suburb. He’s got some family, but they’re all crazier than him, and he knows from crazy. Theo, his estranged twin, has more powerful empathic gifts and moved to NYC shortly after high school ended, but Nate’s hidden his empath abilities nearly his whole life, like their mother–who went crazy and killed herself–had instructed. Nate wants to fly under the radar, but he’s overcome by a vision of Theo being drowned, in a way that’s totally sketchy, and he knows his brother is dead. The only way to discover the truth behind it: head to NYC. Only Nate has barely a few hundred dollars to his name, and his big idea–to hitch his way from Texas–isn’t the smartest. Trent is a graduate student living in LA and driving home the southern route so he can visit friends in Houston. This has him crossing paths with Nate twice. The second time, he offers Nate a ride. Along the several days ride, Trent and Nate develop a connection, which is far stronger than Nate has ever experienced. Though Trent has never had sexual relations with a man, he believes himself to be bisexual, and he wants some intimacy with Nate. Nate’s attracted to Trent, too, but he’s used to walling himself off from everyone to keep their emotions out of his head. So, both are reluctant to make the first move. Not that it doesn’t happen, because it does, but this isn’t a traditional romance. What happens in New Orleans, though, doesn’t stop when the trip ends. Still, once they reach the bright lights of NYC, Nate goes his own way, promising to keep in touch with Trent. Nate knows he needs to touch base with Theo’s closest friends if he wants to learn the truth, and he doesn’t want to involve Trent in what might be dangerous. Plus, Trent doesn’t know about the empath community and Nate’s afraid Trent will balk if he thinks Nate is somehow using his gift to influence Trent into being gay-for-him. Connecting with Theo’s pals alerts The Community that Nate’s on the scene, however. The Community is a hidden network of empaths and telepaths in the NYC area. Nate had no idea of the scope, what with his sheltered rural Texas life, but he’s appropriately wary of the cadre of folk who want his loyalty and service. The more Nate learns, the more sinister things seem, and he reaches out to Trent for some normalcy, and insight, because Trent is truly the only person he feels he can trust. I really liked the twists and turns of this one. Expect it to morph into a thriller near the end. More empaths have gone missing/dead than just Theo, and Nate’s put himself on a path that is far from safe by poking through the hornet’s nest of intrigue that is The Community. As a reader, it was hard to know from what corner the danger came, and that’s a testament to the fantastic writing here. The romance is not formulaic, and was all the more interesting due to the odd circumstances. Also, it was freaking unbelievably hot when Trent and Nate got it on. Nate’s empathic abilities grow, and he’s able to experience his and Trent’s lust, and turn that back on them–creating a chemistry that is downright combustible. Interested? You can find INSIGHT on Goodreads, Riptide Publishing, Amazon, Barnes & Noble and iTunes. I received a review copy of this book via NetGalley.